I lived in Chicago for 3 years, but never made it to Dark Lord Day. I won't say that I didn't try, I just wasn't able to get tickets, was out of town at the time or just didn't want to deal with the hoopla. I would call myself a 'intermediate level' craft beer drinker. I enjoy great craft brews, can pick out 'hints' of this and 'hints' of that, I have brewed beer on my own and have been to about 35-40 different breweries across the U.S., Canada and Europe. I know that may seem 'expert level' to some, but a beer event such as this can make you feel like a beer idiot. Partly due to the d-bag beer snobs that try to pick out 'notes', mention beer-food pairings and that are just a-holes with their analysis of beer. Its beer. Anyone can drink it. You don't need a lesson plan to drink it. If you enjoy it, that's all you need to justify your belonging at a beer event. 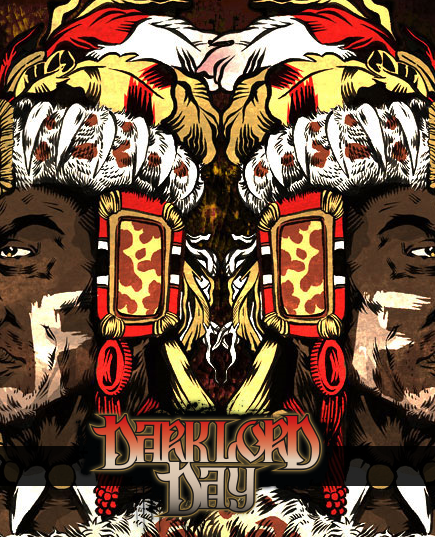 "Dark Lord Day is the only day of the year to buy Three Floyds Dark Lord Russian Imperial Stout. It is a festival where participants can meet other beer enthusiasts, sample beers from all over the world, buy Dark Lord Russian Imperial Stout, enjoy good food, listen to live music and generally have a great time." The key here is its a big party. Heavy metal music being cranked with beer flowing. I've been to 3 Floyds several times and can tell you their food is insanely good. I'm thinking this will be more grilled food than full plates, but who knows. This is an event in which standing in line is part of the fun. Sampling the guest taps will be a blast, but its encouraged to bring a few rare bottles or local to your to your region to share with others. I've heard lines will be long for everything though. Not only to purchase Dark Lord, but also for other beer, food and the ATM, which is key because this is a cash only event. I'm planning on bringing a few hundred bucks to be safe just so I don't have to stand in line to get money then go to another line to buy beer. As mentioned its encouraged to bottle share while waiting in line. I was told from friends that are veterans to the event that maybe 4-5 12 oz. bottles or a couple of 22oz. bombers will be sufficient as they won't let you in the gate with your own beer, just outside while you're waiting. I'm bringing some Fathead's Hop Juju, Fathead's Headhunter and Brew Kettle White Rajah in from the Cleveland area. Its also helpful to bring smaller taster cups (plastic) if you're taking tastes from others. Asking for a sample from someone with a gigantic red Solo cup is probably a jerk move. 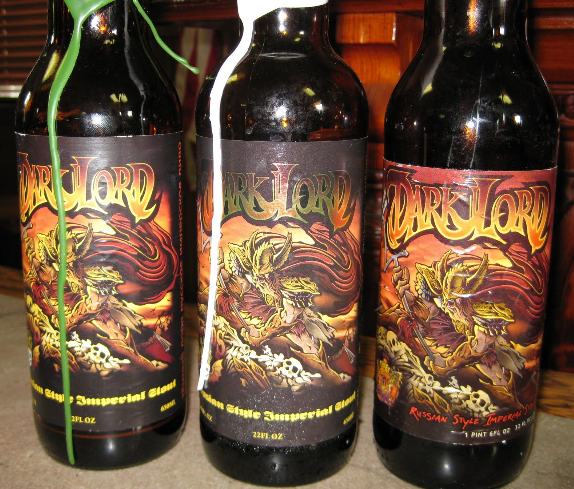 Dark Lord is one of the most rare beers in the world, sold on only one day of the year, Dark Lord Day. Its only sold to those lucky enough to buy a ticket for the right to buy an allotment. Sounds awful, doesn't? Well, it is. Getting a ticket online the day they go on-sale and pay for it is tough enough, but then 3 Floyds asks you to wait in line to use that ticket to then purchase Dark Lord. Kind of a cash grab, but well worth the hype. I've tasted 2009 and 2010 versions I believe at a beer tasting party a few years back and it packs a wallop. A 22oz. bomber supposedly has 50% more calories than a McDonald's Big Mac and is 15% ABV. Its also made with espresso beans (dubbed Unicorn Blood) from Chicago coffee establishment Dark Matter in the Ukrainian Village neighborhood. This is a change to the recipe from years past in which 3 Floyds used famous Chicago coffee distributor Intelligentsia's beans. This might alter the taste of the beer, but it might be for the better as Dark Matter is known for having some of the best coffee in the Midwest. 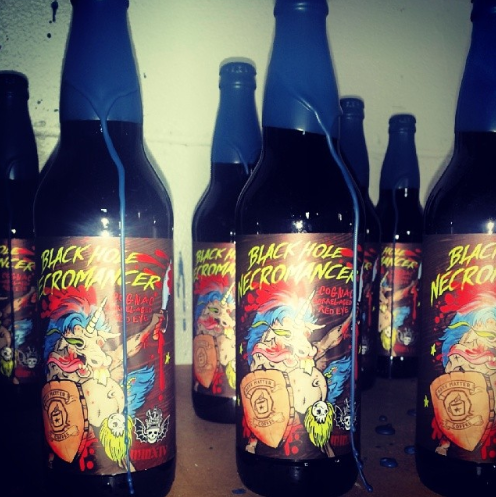 Black Hole Necromancer - Unicorn Blood Espresso blend aged in a Remy Martin Cognac barrel. Burundi Dukorere Ikawa - aged in a Koval Lion's Pride barrel. Rwanda Misozi Kopaki - aged in a Woodford Reserve barrel. Hopefully the whole experience is a blast. I'm sure it will be. It wouldn't be such a hot ticket if it wasn't. It's all about the beer.